Sickle cell anemia is an inherited form of anemia - a condition in which there are not enough healthy red blood cells to carry adequate oxygen throughout through out your body. There's no cure for most people with sickle cell anemia. Sickle cell anemia is caused by a mutation in the gene that tells the body to make hemoglobin - the red, iron-rich compound that gives blood it red color. The sickle cell gene is passed from generation to generation to generation in a pattern of inheritance called autonomic recessive inheritance. This means that both the mother and the father must pass on the defective form of the gene for the child to be affected. People with the Sickle Cell trait have one normal hemoglobin gene and one defective form of the gene. So their bodies make both normal hemoglobin and sickle cell hemoglobin. 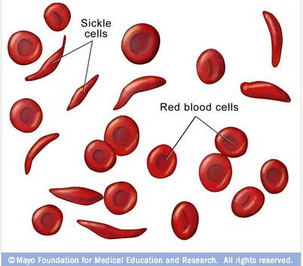 Their blood may contain some sickle cells, but they generally do not experience symptoms. The most commonly known symptoms of sickle cell disease are the chronic and acute pain attacks that occur when low oxygen in the body causes the red blood cells to become rigid and misshapen. The misshaped blood cells can become lodged in the blood vessels and deprive tissues throughout the body of much needed oxygen. This can cause anemia, Sickle Cell Anemia cells are fragile, episodes of pain, hand-foot syndrome, jaundice, frequent infections, delayed growth and vision problems. A blood test can check for hemoglobin S - the defective form of hemoglobin that underlies sickle cell anemia. In the United States this blood test is part of routine newborn screening done at the hospital. But older children and adults can be tested too.